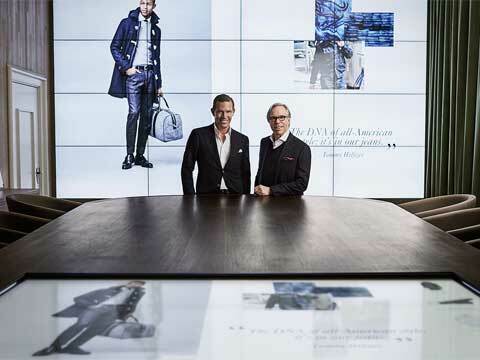 PVH Corp owned Tommy Hilfiger has launched a digital sales showroom at its global headquarters in Amsterdam. The digital showroom will offer them a more engaging and seamless buying approach for retailers. The interactive system combines information, sales tools and brand content in one touchscreen interface. “Our digital showroom revolutionizes the buying and selling journey for our retail customers and internal sales teams,” said Daniel Grieder, CEO, Tommy Hilfiger. The centerpiece of the digital showroom is an interactive half-meter by one-meter touchscreen table set in a walnut frame, which connects to a four-meter-high wall-to-wall grid of ultra-high-definition 4K screens. Customers can digitally view every item in the Tommy Hilfiger sportswear and Hilfiger Denim seasonal collections and create custom orders with all product categories laid out across a single screen. The product selection and ordering experience builds on a traditional sales approach, reimagined through the digitalized system that streamlines and simplifies the process. Our unique digital showroom concept is a juxtaposition of craft and innovation,” said Tommy Hilfiger. 'The digital showroom concept also eliminates the need for printed order forms. The environmental impacts of sample creation are significantly reduced, from the supply chain and manufacturing to packaging and international shipping,' said the company. Tommy Hilfiger will launch its digital showroom on January 21, 2015, in Amsterdam with international wholesale partners, and the company is establishing a global roll-out plan to expand the concept into markets worldwide.